Let's welcome 2019 with a list of my favorite podcasts from the end of 2018, in descending order of preference. 1. The Talk Show With John Gruber There's just something about Gruber's voice that beckons me to look through my Overcast favorites for a new episode, which usually comes once every two weeks. Almost always with a tech pundit guest, Gruber never conducts an interview, but instead simply converses from beginning to end at a relaxed pace, often resulting in two, three, and on rare occasion, even four hour long episodes, without any music intros or gimmicky sound effects. Enthusiasm for Apple is the regular topic, with commentary on a wide range of other related tech topics. Apple bias: 9 out of 10. 2. Techmeme Ride Home The perfect blend of tech headlines and brief, sometimes snarky commentary, this daily episode is the excellent round up of tech news that I was looking for a few years ago. Recorded in New York City, it brings an East coast perspective to what is often Silicon Valley focused news. Apple bias: 5 out of 10. 3. Accidental Tech Podcast The best thing about ATP is the trio of hosts who bring a great mix of technical depth, clearly articulated opinions, and a dynamic of humorous banter. Apple bias: 7 out of 10. 4. Upgrade A few things set this tech podcast apart. There are named, regular segments to the show, and co-host Jason Snell seems to straddle dueling roles of primary guest and secondary host. Snell is the primary host on many other podcasts, but this seems to be his weekly forum for being interviewed. Apple bias: 7 out of 10. 5. The Chad & Cheese Podcast: HR's Most Dangerous Podcast After listening to many HR recruiting related podcasts, I found myself always coming back to Chad & Cheese. They do their homework, they get interesting guests, they are consistently snarky, and most importantly, the show has gotten better over time. They have room to further improve (audio volume levels still inconsistent, the sound effects are still overused, overemphasis on vendors instead of practioners), but this is the go-to podcast for keeping up with the recruiting tech industry. Their heavy use of swear words means I can't listen while my kids are in the car. 6. Vector with Rene Ritchie The Apple analysis from Rene is always deep and rational, although his bias in favor of Apple is sometimes a bit much, even for me. Most of his episodes are scripted audio versions of his YouTube show, which are not as enjoyable as when he is in a more conversational setting. Most of his podcast guests are fascinating, although he has had a few snoozers. Listen for the occasional, brief and very subtle Star Trek: The Next Generation references. Apple bias: 10 out of 10. 7. Pocketnow Daily I find Jaime Rivera's broadcaster voice quality more compelling than the show content, because the very brief, daily episodes are mostly about Android smartphones which I will never buy (I use a carrier-less Huawei P20 Pro as my primary camera and my last ever Android device). He does cover Apple mobile tech, but with a somewhat healthy skepticism and occasional disdain. Apple bias: 3 out of 10. 8. Subspace Transmissions: A Star Trek Podcast This is my favorite Trek podcast that is still in production (Engage: The Official Star Trek Podcast with Jordan Hoffman, my all time favorite Trek podcast, was unfortunately canceled). The co-hosts are dedicated fans of all incarnations of Trek. They were a bit more critical of Star Trek: Discovery than I would prefer, but their views are always fair and thoughtful. I welcome your recommendations for other podcasts to try, especially those hosted by women. Thanks very much in advance for any leads on new projects. 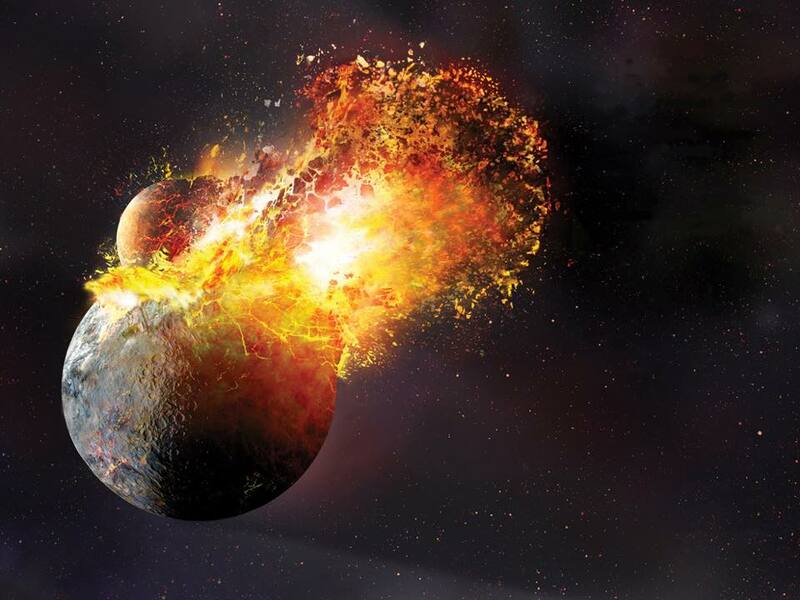 Computer illustration by Dana Berry, commissioned by National Geographic magazine for its July 2013 issue cover, depicting the formation of the Earth's Moon in a scientifically plausible visual style. The prevailing theory is the young Earth collided with a Mars sized planet in a manner that caused much of the Earth's material to eject out and eventually coalesce into the Moon, initially in a nearer orbit than today. I find it fascinating to learn that things we consider stable or permanent on a human timescale, such as the orbit of planets, the distance to the Moon, or even something as fundamental as sunshine, are themselves subject to gradual or sometimes devastatingly dramatic change. Life is precious, the Earth is sacred, and we are not just made of star stuff and a way for the universe to know itself, but we are also a unique opportunity to feel and show gratitude for having come into existence despite literally astronomical odds against us. There is now a set of emerging technology that are competing to be the "next big thing" in tech. Back in the '90s, the Internet rolled into all our lives, growing from a computer network used mostly by universities, government, and the military, to a full blown social, economic, and political revolution. It hardly surprised anyone. We could see it coming. There were even AT&T television commercials depicting everyday life with Internet powered services that we take for granted today. Also during that time, we clearly could see that mobile technology would be big. Cell phones were proliferating, especially the Motorola flip phones. We knew that one day, computers would be handheld and merged with the phone. But we didn't know exactly how soon, nor how ubiquitous mobile tech would become. Of course, mobile tech extended and vastly expanded the reach of the Internet revolution. Now we have some newly emerging technologies that are vying for attention. Namely, virtual reality, augmented reality, artificial intelligence, chat bots, and driverless cars. Virtual reality (VR) promises to immerse the senses of the user, in a manner most easily associated with playing video games. VR tech from decades before were heavy, slow, and expensive, but those constraints have been overcome, largely due to the advances in mobile tech. Sci-fi movies have glorified the promise of VR, yet today's news media regularly portrays users of VR as people acting clumsy in the real world while wearing VR headgear. Having to shut out the real world while using VR has its obvious disadvantages, which makes usage of VR a very intentional and inherently isolating act, not something to do for a few seconds or even a minute here or there, like glancing at a smartphone or casually playing a mobile game app. Augmented reality (AR) trades the immersive aspect of VR with technology that overlays computer generated visuals with a view of the real world. While avoiding the isolation of VR, the use of AR introduces additional complications, such as distractions from real life hazards, and expensive see-through display technology. I think in the long run, AR has more potential for both business and personal applications, than VR. Perhaps there will be a future hybrid AR/VR device that can easily switch between the two modes. Artificial intelligence (AI) has been envisioned for over half a century and has become viable as computing technology has accelerated in processing power and affordability. Many different emerging technologies are closely related to AI, including learning networks, speech recognition, natural language processing, speech synthesis, foreign language translation, and predictive analytics. There is a common fear, also frequently portrayed in sci-fi films, of AI, especially when combined with robotics, resulting in apocalyptic destruction and death, driven by soulless vengeance and limitless ambition for power. Some predict the Singularity will occur, when the machines develop their own intelligence faster than humans can control. Such fears may limit the trust consumers have with AI, which I predict will give initial prominence to AI related applications that only partially automate things, where people feel they still have some control, but enjoy some benefits of AI assistance. Chat bots are a mashup of text messaging platforms and some aspects of AI. The shift in attention from disparate mobile apps to the stickiness of mobile text messaging platforms allows for software providers to refocus the entire user experience of an application to a text based natural language processing user interface. Customer service functions are leading the way. Other functions will likely follow. Chat bots, especially if voice recognition is mixed with the text interface, could possibly become the channel for AI to be accepted into daily mainstream use. Driverless cars have garnered a lot of media and industry attention the past few years. Such vehicles are already in limited use under narrow conditions. Partial automation is also in use in Tesla cars, resulting in some fatal accidents. Truly autonomous vehicles which can navigate all roads under all conditions are still decades away. Fog, snow, and other foul weather hinder the sensors. Navigation maps are not always accurate or up to date. But the impact to the transportation industry will obviously be massive. It is yet to be proven there will be less traffic, but it is hoped that overall traffic safety will improve, while levels of car ownership, already on a downward trend, will likely continue to drop with both the convenience and cost of driverless cars. What is possibly the most tantalizing idea is the likelihood that the next big thing might not be any of these things. It would not surprise some people, especially those of us in Silicon Valley, if some entirely new technology, built by a previously unknown, innovative teenage girl in her parents garage or basement or bedroom corner, rapidly emerges as the next big thing to change the world. Like it or not, it has become abundantly clear that LinkedIn profiles are the only viable online replacement to traditional resumes/CVs. The "death of resumes" certainly is not imminent, but for all the many different proposed / launched alternatives, LinkedIn has won, hands down. While growing up, I always assumed my name was entirely unique. I knew Mason was a somewhat common last name and an infrequently used first name. It wasn't until college that I actually met someone else with the same first name. In fact, by my junior year, I had met two Mason's. Statistics show in the past 15 years, Mason has become a very popular name for baby boys in the U.S. I still don't understand why. It wasn't until the early growth of the web, around the mid-'90s, that I started to learn of other guys named Mason Wong. It started with a stranger emailing me asking if I was the Asian American studies professor who taught long ago. Since then, I've come across and exchanged emails with a few other Mason Wong's around the world. Recently, I found a growing number on Facebook. One Mason Wong with some media and Internet exposure is the restauranteur and nightclub owner in Sacramento. Occasionally, I receive misdirected emails intended for him (apparently, we have similar addresses with a major email provider). As of this writing, I have not had direct contact with him. Others are accessible via Facebook. Copyright 2008-2010 Mason Wong. Picture Window theme. Theme images by sololos. Powered by Blogger.